The Sun on your birthday awakened Cancer the Crab, a feminine sign in the zodiac. The Sun in astrology stands for your inner nature, your essential character. The fourth sign of the Zodiac, Cancer is ruled by the restless Moon. 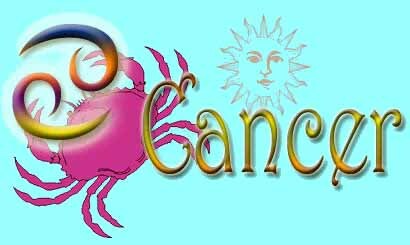 A cardinal (creative and original) sign, Cancer governs home life, matters to do with women (especially the mother), as well as sensitivity and emotional intensity. It is a water sign, so Cancerian people are emotionally intense and deeper than they appear on the surface, while quite sensitive and understanding once you get through that tough exterior. Ideal colours are white, silver, and pale yellow. Cancer rules metallic silver, while both the ruby and the pearl are the traditional Cancerian birthstones. Silver reflects its environment in its shiny polished surface, yet it can tarnish and become dull unless properly cared for. In the same way, your sensitive nature reflects the people and circumstances surrounding you. The precious ruby, a variety of corundum, is one of the hardest minerals known, while the pearl is soft and easily scratched. Here we have the two contrasting sides of the Cancerian personality: hard and determined, yet simultaneously soft and vulnerable. Cancerian flowers are the water lily (lotus), iris, white poppy, white carnation and southern magnolia.